I got a call the other night at around 11PM from Bert, the owner of Bear Creek Beers. "Erik," he said to me, excited, "Have you tried the Gubna yet?" I tried to explain that I was trying to go to sleep, but he kept going. "I think it's going to be the next Pliny the Elder! I swear, it tastes just like Pliny!" He has a reason to be excited, of course. Pliny the Elder is very hard to get in Southern Oregon, and every time Bear Creek Beers gets it in stock, it sells out in hours. It is hard to see all of those sad hop-heads lusting after their Pliny, lurking outside the doors to the shop day after day. 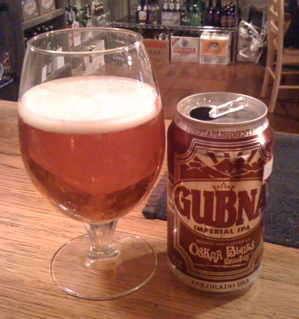 So anyhow, at that point I had only had a couple sips of the Gubna Imperial IPA from Oskar Blues, and hadn't really given it a lot of thought. I realized I should go back and take another look at it, so I did. I have to say, it's a pretty good imperial IPA, but it's still not quite Pliny the Elder. Where Pliny hits the nose with a fresh, grapefruit-laden blast of hops, Gubna tends more toward a grassy, floral smell. And even though Gubna is 100 IBUs, I didn't find that the hops really stood out as strongly on the palate as they do in Pliny. But do not be fooled, for Gubna is a hop bomb. It has a nice medium body, and a good maltiness that helps hide its 10% ABV, and it's far easier to drink than I'd assumed it would be. It pours a golden-copper color with an off-white head, but the head tends to be thin and difficult to coax from the can. The hops, though big, are balanced nicely against the malt, and overall I found this to be a nice imperial IPA. Not too sweet, far too hoppy (which is how they're supposed to be, of course), and easy---but not effortless---to drink. We finally got the chance to try the Gubna next to Pliny the Elder, and found that while the two are indeed very similar, there are some marked differences. The Gubna is darker in color, has a thinner head, and smells more grassy and floral. On the palate it is much stickier and sweeter. Pliny the Elder, on the other hand, has a very bright, fresh, citrus smell. Very much like grapefruit. Both are total hop bombs, of course. I posited that the difference may have been in freshness, but it turns out that both had the same "packaged on" date. Interesting! This page contains a single entry by Erik Arneson published on April 9, 2010 6:06 AM. The Beer Journal from 33 Beers was the previous entry in this blog. How I Learned to Stop Worrying and Love Cabernet Franc is the next entry in this blog.